Research from Princeton University published recently has found a relationship between higher rainfall and lower numbers of trees in savannah ecosystems in Southern Africa. The researchers have used mathematical models, in conjunction with ground truthing to validate an explanation for this. Their argument is, that grasses are more effective and efficient at making use of higher rainfalls, and therefore prosper at times of increased rain. Trees however are not as efficient at using abundant water resources, but are more effective at surviving in longer, dryer times. 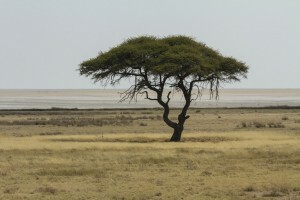 As such, savannahs that have been affected by higher rainfall, have comparably less trees than those in dryer areas. Is this evidence that nature is promoting trees as an adaptation to less rain? Current predictions of climatic variation include both increased extreme weather events, and periods of both drought and high rainfall. This information may assist in predicting how savannah ecosystems are likely to react to long term variation and can be used to assist in planning and prioritizing management practices such as farmer managed natural regeneration and sustainable grazing regimes, given the likely pressures that either trees or grasses may be under in the future. While the research indicates warns of threats to trees in savannah ecosystems in periods of intense rainfall, on the other hand, it also promotes the value and role of trees in dry periods. Times of high rainfall, while not without their challenges of flooding etc, are generally times of abundance, good crop production, high grass growth and fat animals. Dry periods however are associated with crop failure, livestock losses, and food insecurity. The greater resilience of trees during these periods, highlights their value for maintaining biomass (that can be used for fodder or other non-timber tree products), and increasing the resilience of ecosystems and the communities that rely on them in dry periods. Evergreen Agriculture systems that encourage a healthy mix of tree, pasture and crop production systems also recognize this value, and will be of increased significance in the future.